Dan Khanna has done work as a penciller on various comic books over the years for companies such as Dreamwave, IDW Publications, Titan UK Publications, and the Transformers Collectors Club/Botcon collectors Conventions.He has done concept design, full packaging illustrations as well as color work on many Transformers brand box art illustrations across several toy lines for Hasbro Inc. Dan has also provided statue designs for Hard Hero, and Titan Books/EagleMoss publications. 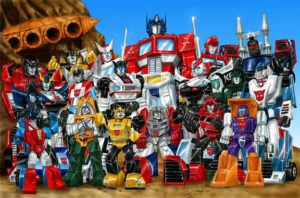 He has recently completed a three year long project working as one of the regular pencillers for the Transfomers Legends mobile card game for DENA, and worked on Transformer Prime comic strips for an Transformers Prime magazine. Dan has worked on concept work for the Imaginarium Transformers statue line and the designs and package art Soap Studios Transformers Sufubi line of Vinyl figures as well. Dan is well versed in traditional black and white pencil/pen and ink illustration styles with people and sci-fi robots, and can provide full color services as well via Photoshop.